Russia's nuclear icebreakers: a new dawn for coal exports? Russia’s nuclear icebreakers: a new dawn for coal exports? Atomflot's expanding nuclear icebreaker fleet brings with it a number of industrial and geopolitical implications, including a possible boost for Russia's coal exports. Chris Lo ponders the ways in which the opening of new shipping routes could prompt a dramatic turnaround for the country's coal export prospects. 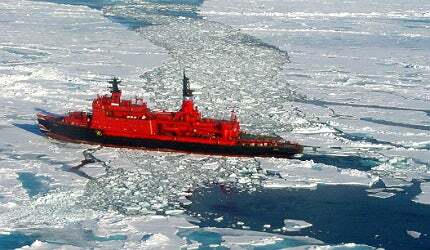 Russia maintains the world's only fleet of nuclear-powered icebreakers. Image courtesy of Dmitryi Kascheev. Powerful icebreakers will likely be needed to ensure that the increasingly viable Northern Sea Route is navigable throughout the year. Image courtesy of Wofratz. The LK-60 will be larger and more powerful than any current nuclear-powered icebreaker. Russia's former Energy Minister Sergei Shmatko has highlighted the importance of the Asia-Pacific region as a destination for Russian coal exports. Image courtesy of Вадим Кондратьев. At the beginning of August, Atomflot, the state-owned Russian company that maintains the world’s only fleet of nuclear-powered icebreakers, announced that it had contracted Baltic Shipyard to build a new nuclear icebreaker, the LK-60. Measuring an immense 173m x 34m and with a 60MW power capacity, the LK-60 is set to become the world’s largest and most powerful nuclear icebreaker upon its completion in 2017. "More extensive use of this marine gateway hinges on the availability of icebreakers to ensure that it is navigable all year round." Russia is the undisputed world leader in nuclear-powered icebreakers, and the announcement of its most powerful vessel yet has a number of industrial and geopolitical implications. Trade-wise, a major addition to the country’s nuclear icebreaker fleet will undoubtedly provide a boost for Russian shipping in the hostile, frozen seas off the country’s northern coast. This could have a considerable impact on the country’s coal export sector, which, because of transport inefficiencies and other factors, is flagging despite Russia’s massive coal reserves, the second-largest in the world. The prospect of the LK-60 has also made a splash in a geopolitical sense; Russia is currently asserting its exclusive economic rights to large swathes of the Arctic Ocean against competing claims from the likes of the US, Norway, Canada and Denmark. Russia’s icebreakers are playing an important role in mapping the undersea borders of its continental shelf, which is needed to confirm its territorial claims. The LK-60 could certainly prove to be a valuable asset in an episode of bullish territorial diplomacy that has already seen Russia plant its flag in the seabed and a Moscow-based think tank suggest rechristening the Arctic Ocean as the Russian Ocean. As well as potentially reinforcing Russia’s territorial ambitions, the LK-60 could carve a path for new developments in Russian coal exports and the wider energy market. "An increasingly viable Northern Sea Route could bring down sea freight prices and reduce reliance on rail." As climate change continues to shrink the permanently ice-covered areas of the Northern Sea Route running along Russia’s northern coast, this shipping lane is becoming increasingly attractive as a trade route. But more extensive use of this marine gateway to Europe and Asia hinges on the availability of icebreakers, preferably the more powerful nuclear-powered models, to ensure that it is navigable all year round. Could the opening of a more reliable shipping route in the Arctic Ocean give a shot in the arm to Russia’s export trade in coal? It should be made clear that there has been no official indication that coal export considerations have played a part in Russia’s expanding fleet of icebreakers – the only confirmed fact about the LK-60’s work is that it is intended for operation in the western Arctic Ocean and shallower waters such as the Yenisei River and the Gulf of Ob. Nevertheless, the unique circumstances of the country’s coal market suggest that it could be an important beneficiary of better trade links through the Northern Sea Route. "Russia is sitting on one of the largest national coal reserves in the world, but faces significant challenges in exporting it." It’s impossible to ignore the fact that Russia is sitting on one of the largest national coal reserves in the world, but faces significant challenges in exporting it. The country’s estimated 140 billion tons of coal represents nearly a fifth of the world’s total reserves, but around 90% of this coal is located in large basins in Siberia, much of it behind the Ural Mountains, where transporting it can be prohibitively troublesome. A major source of inefficiency in the Russian coal industry is the high cost of transporting coal both to ports for international markets and to western Russia, which represents most of the country’s domestic demand. In April 2012, Reuters reported on the sorry state of the country’s rail infrastructure for hauling coal freight, with major bottlenecks creating some of the highest costs for getting coal to port in the world, at $90 FOB or more. While Russia’s tracks must ultimately undergo a logistical revolution before the country can achieve its coal export potential, in the short-term it is creating a need for new ways to save costs and add value to their products, and an increasingly viable Northern Sea Route could bring down sea freight prices and reduce reliance on rail. It’s certainly true that Russia has a long-term plan to increase coal exports, as it expects international demand to grow to 170 million tons a year by 2030. To achieve this, the country’s export focus is gradually shifting from the traditional European market, which is experiencing a slowdown in demand, as the EU continues to introduce strict environmental regulations, to east Asia, where expanding economies such as China and South Korea make excellent markets for Siberia’s low to medium-grade coal exports. In August 2010, Moscow and Beijing signed an agreement for Russia to supply at least 15 million tons of coal to China every year for the next 25 years. "Establishing of [favourable] conditions for exports to the Asian-Pacific region may become a major strategic project, which would strengthen our economic presence in this dynamically developing region," said Russia’s former Energy Minister Sergei Shmatko, signalling the shift from west to east. With Russia’s land-based transport proving a major obstacle to coal export growth, the role of convenient shipping lanes like the Northern Sea Route could improve efficiency and provide a better deal to prospective customers, such as nearby Scandinavia and Japan, and particularly the hungry, industrialising nations of the Asia-Pacific. If the LK-60 is destined to play a role in the taming of the Arctic Ocean for Russian shipping, it could potentially help pioneer a path for a resurgent Russian coal export market. To double its nuclear hold by 2030, Russia will have to become a driving force in an industry struck by crisis. But can technological progress and increased international collaboration disperse the concerns about the country’s ageing power plants and safety standards? Is climate change rewriting the global shipping map? Arctic sea-ice reached a new all-time low in 2012 – another milestone in pattern which has, in recent years, seen both Canada’s Northwest Passage and Russia’s Northern Sea Route (NSR) open simultaneously for the first time in recorded history.